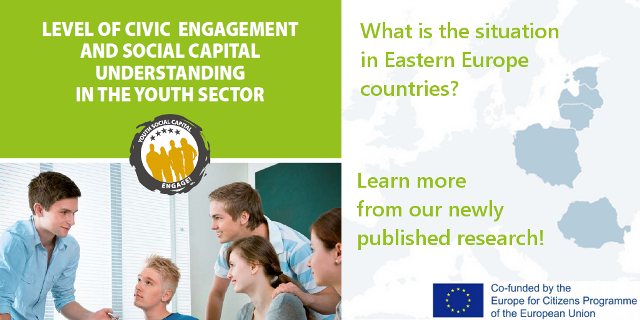 During this event the research results of “Level of Civic Engagement and Social Capital Understanding in the Youth Sector in Eastern European Countries” were presented – read more about the research here and the detailed document is available for download here: SOCAP project research [PDF]. The research results presentation was followed by round table discussions on topics such as youth engagement, civic participation/organizations, volunteering on local level, volunteering abroad, youth entrepreneurship, networking, European citizenship (values, rights, opportunities), youth information and possibilities, youth involvement in policy making, diversity. The event was concluded by the ceremony of prizes where the authors of best submissions were announced and awarded. The list of the winners is available here. The event presentation is available for download here: SOCAP closure event presentation [PDF].